Based on the recommendation of the Worship Advisory Group that was formed earlier in the year, and with the approval of the vestry, we have undertaken a search for an organist who is specifically trained in pipe organ and church music. Surprisingly, we already have someone interested in the position and he will be with us for the next four Sundays on an interim basis. I’d like to tell you a little bit about him and encourage you to be at worship some or all of the next several weeks. Dr. Gabriel Statom lives in Memphis and has extensive experience in church music. He has a Bachelor’s Degree in Music Education, with an emphasis in vocal and piano, from the University of Mississippi, which he attended on a full music scholarship. His Master’s Degree in Music, with an emphasis in organ, is from Florida State University and his Doctor of Worship Studies is from the Robert E. Webber Institute for Worship Studies. He has served in a variety of churches and been active in many community music groups. Earlier this week I had lunch with Dr. Statom, who goes by “Gabe.” I found him to be friendly and a committed follower of Jesus Christ. I think he is a good “fit” for St. John’s and I hope you can be present to welcome him this coming Sunday, October 7. You may be wondering what happens to our current keyboard person, Dagmar Bergan, if we hire a new organist. The good news is that Dagmar will remain on staff at St. John’s. Dagmar is an extremely talented pianist, but is not specifically trained in organ. She will work alongside the new organist and myself to strengthen our music program and contribute to our goal of becoming a church that draws folks from throughout this part of the Delta. I am asking everyone to please plan to be present for worship and the luncheon following it on Sunday, November 4. We will be observing All Saints Day in worship. Guest musicians will be The Mighty Souls Brass Band who were last with us on Easter Sunday. During lunch, representatives from several local ministries will present brief (5 minutes or less) statements about how their ministry is making a difference in Helena-West Helena and how we can support them. Please keep the following in your prayers: Susan Worrell, Debra Richardson, David Henderson, Kathy Sullivan, Jimmy Billingsley, Larry Bryant, Lynn Jordan, Ray Worley, Carol Jennings, Nancy Howe, Jim Howe, Parker Pace, Heather Treat, Julie Ann Doan, Courtney Turner, Sheila Fraiser, Gwen Newkirk, Sharon Hinderer, Jeffery Hinderer, Scott Hinderer, Mica Cole, Blake Robertson, P.J. Clay, Rev. Mike Wilkie, Kelly Namour, Rita Merritt, Virginia Topp, Winston Carter, Jerry Staley, Gloria Higginbotham, Kent Shreeve, Bobby Anders, Rick Anderson. EPISCOPAL RELIEF & DEVELOPMENT: If anyone would like to donate to the Hurricane Relief for North Carolina, contributions may be made to the church and will be sent to ER&D from St. John’s. Operation Christmas Child (OCC) has begun! 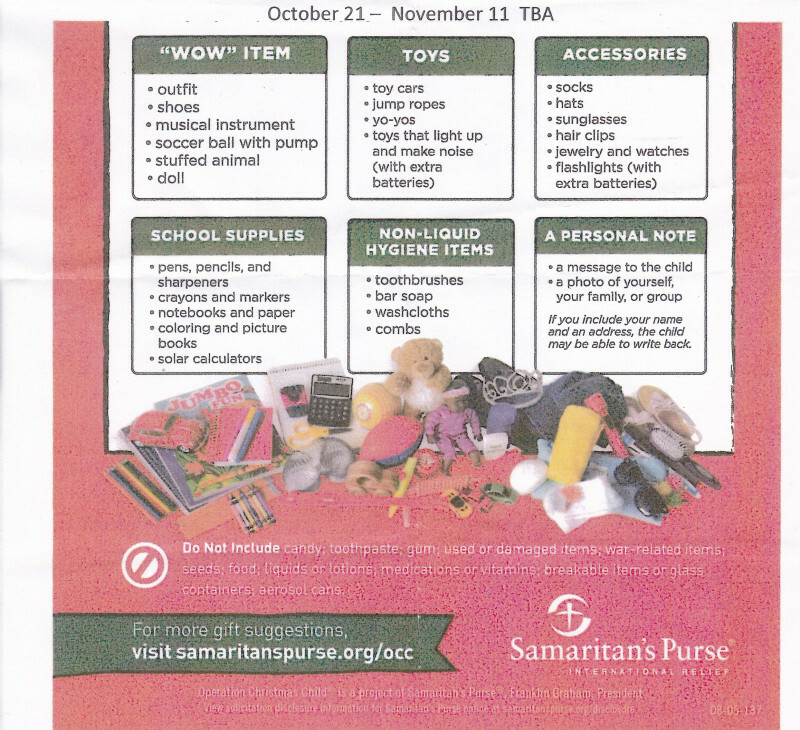 Each Sunday through November 11th , a list will be highlighted. This year we are targeting boys and girls 5-9 only. Please bring from the following list (below) of CLOTHING & ACCESSORIES for this Sunday and place in the red wagon. Thank you for your support. Oct 10, Wed at 4:00 pm: All Altar Guild members will polish.